Natural and man-made catastrophes have caused significant destruction and loss of lives throughout human history. Disasters accompany a wide variety of events with multiple causes and consequences often leading to a cascade of related events. African continent has not been spared of these events. A new phenomenon in the continent is terrorism that is fuelled by globalization of arms trade and has contributed significantly to escalation of conflicts in sub-Saharan Africa (SSA) resulting in complex emergencies and destruction of socioeconomic structures. The aim of this paper is to review relevant papers on management of disasters and complex emergencies in Africa and the challenges and constraints against the background of a weakened health system. Systematic search of published literature was conducted between 1990 and 2013. Grey literature (technical reports, government documents), published peer review journals, abstracts, relevant books and internet articles were reviewed. The review revealed that the frequency of both natural and man-made disasters in Africa is escalating. Complex emergencies are also on the increase since the Rwandan crisis in 1994. The impact of these events has overstretched and overwhelmed the health care system that is least prepared to handle and cope with the surge capacity and also render normal services. In conclusion, there is an urgent need for national emergency agencies/departments across Africa to develop a robust emergency preparedness and response plan. Every hospital most have a disaster management committee with flexible disaster management plan to respond to these catastrophes. There is a need for curriculum review in tertiary institutions across SSA to introduce and or expand training in disaster management. Background: Fetal biometry by ultrasound provides reliable and important information about fetal growth and wellbeing. Evaluation of the fetal posterior fossa is useful in the assessment of neural tube-defects. Studies on normal ultrasound fetal cerebellar appearance and diameter across gestational age (GA) are scanty in the Nigerian medical literature. This study was carried out to study normal fetal cerebellar appearance and diameter at various GAs among healthy pregnant Nigerian Africans. Materials and Methods: This was a prospective study of 450 healthy singleton pregnant women between 13 and 42 weeks gestation. A curvilinear probe with a 3.5 MHz transducer of a SonoAce X6 (Medison Inc., Korea 2010) scanner was used to assess fetal transcerebellar diameter (TCD) and appearance. GA was also determined using fetal biometric parameters such as the biparietal diameter, femur length, and abdominal circumference. Fetal cerebellar appearance was correlated against GA. Results: The cerebellar appearance was graded into: Grade I: 164 fetuses (36.4%), Grade II; 102 fetuses (22.7%) and Grade III: 184 fetuses (40.9%). Mean GA and TCD was 21 weeks and 21.2 mm for Grade I; 28 weeks and 32.6 mm for Grade II; and 35 weeks and 47.1 mm for Grade III. There was significance difference among the cerebellar grades at the GA groups and transverse cerebellar diameter (P < 0.000). Conclusion: There is a gradual and steady change in ultrasonographic appearance of the fetal cerebellar and diameter appearance with advancing gestation. The changes ranged from anechoic, "pair of eye glass" appearance at second trimester to relatively echogenic, "dumb-bell" appearance at early third trimester, and solid, "fan-shape" in late third trimester. Background: Chronic kidney disease (CKD) is associated with many traditional and nontraditional risk factors. Screening for these risk factors has been associated with appropriate interventions and preventive measures in the management of CKD. The aims and objective of this study are to screen for risk factors of CKD in a Niger Delta community in Nigeria. Subjects and Methods: This was a cross-sectional study. The study location was Ido, a Niger Delta community in Rivers State. All subjects aged 18 years and above who gave consent were recruited for the study. Their bio data, relevant medical history, clinical and laboratory parameters were documented. The obtained data were analyzed with SPSS versions 17.0. Results: A total of 105 persons participated in the study. The age range was 18-86 years, 50.5% were above 50 years. Females were 75.0%, 66.7% had either primary or no education, 14.6% were retiree and 40.4% were traders. 14.1% were known hypertensive, and 39.4% had elevated blood pressure. 6.1% were known diabetic and 6.1% had random blood sugar of 200 mg/dl and above. 27.2% of subjects were obese. About 10.5% and 27.8% had a history of significant intake of tobacco and alcohol respectively. Total serum cholesterol was higher than 200 mg/dl in 51.5%. None of the participants had past or family history of kidney disease. Conclusion: The prevalence of risk factors for CKD in the Niger Delta community is high. 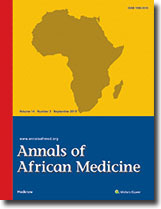 Background: Awareness and demand for neuraxial pain relief for labor are on the increase, but epidural technique appears to be the preferred option among anesthetists in Nigeria. We describe our experience with combined spinal-epidural (CSE) analgesia to fill the gap in knowledge in order to boost its utilization. Materials and Methods: In this retrospective observational study, data were collected from the obstetric analgesia proforma completed for all CSE analgesia performed for labor pain relief between January 1, 2011 and June 30, 2014. Results: Thirty parturients (21 nulliparous: 9 parous) with a singleton gestation in labor with a mean age of 31.0 ± 4.1 years were studied. In all, 56.7% of parturients requested for analgesia following oxytocin augmentation. The overall mean onset of analgesia and cervical os dilatation at initiation of analgesia were 2.23 ± 0.43 min and 3.4 ± 1.3 cm respectively, with no significant difference between groups. Overall analgesia was adequate in 90% of cases, and 76.7% had spontaneous vaginal delivery; although only nulliparous parturients (23.3%) had cesarean delivery, it was not significant (P = 0.07). There was a significant difference in Apgar score at 1-min between nulliparous and parous groups (7.7 vs. 8.9; P = 0.03), but no difference at 5-min. The side effects observed were vomiting and shivering. Conclusion: CSE technique can be safely used in every laboring parturient irrespective of parity either in early or late labor situations. Background: The salivary glands consist of three major paired glands (the parotid, submandibular and sublingual) as well as numerous minor salivary glands, situated mostly in the oral cavity but also found in the pharynx, larynx, trachea, and sinuses. Tumours of salivary glands show a wide variety of pathologic types varying from benign to malignant. More salivary gland tumours are benign than malignant. Patients and Methods: Data for this study were obtained from retrospective survey of case notes of all patients with Salivary gland tumours seen at the Maxillofacial Unit, Ahmadu Bello University Teaching Hospital, Shika, Zaria between January 2003 and August 2013. Results: There were 135 patients 73 (54.1%) females and 62 (45.9%) males within the age range of 2.5 to 80 years (41.85 years). Thirty nine (28.9%) were benign while 96 (71.1%) were malignant. Major salivary glands were involved in 60.7% of tumours; the rest 39.3% involved minor salivary glands. Pleomorphic adenoma (86.7%) formed the bulk of benign tumours while adenoid cystic carcinoma (47.5%) was the predominant malignant tumour of salivary glands. Of 135 patients (n=,57.1% had surgery in our institution and were followed up. Those with malignancy also benefited from radiotherapy, chemotherapy or palliative oncology treatment. Conclusion: Management of salivary glands tumours in our environment is a challenge due to late presentation and the size of the tumour. Sella/parasellar tumors with intraventricular extension present unique neurosurgical challenges in achieving gross total resection with minimal morbidity and mortality. Firm attachment of large tumors, especially craniopharyngiomas, in this location to critical structures, makes the goal of complete microsurgical resection more difficult to attain. Several traditional surgical approaches are available. We report two patients who had novel combination of the traditional extra-axial microsurgical and transcortical transventricular endoscopic approaches to resect sellar/suprasellar tumors with intraventricular extension as either staged or simultaneous procedures.